Really quite pleased with the title of this blog post. It refers to the postal code for down-town Reykjavík (the old city) and so links nicely with my last post. It’s also the name of an acclaimed Icelandic film, so gives the impression that I have my finger on the pulse of popular culture. Nice. 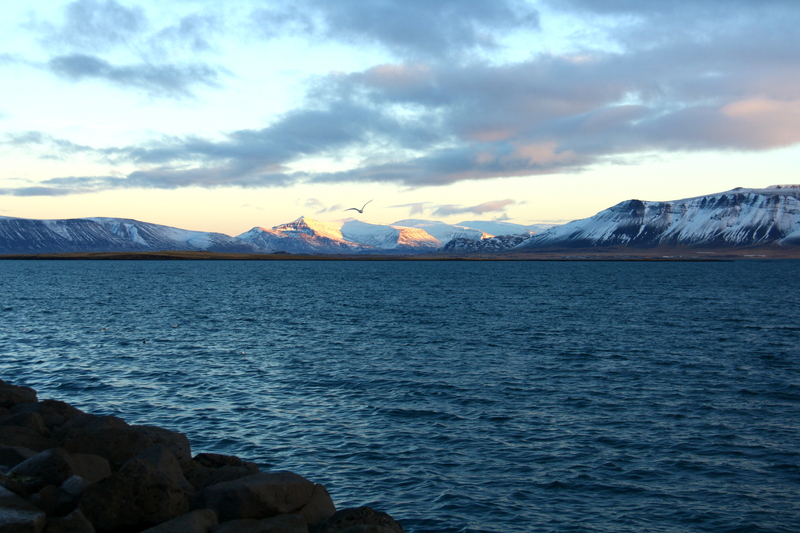 Not entirely without self-regard, I’d chosen a long weekend in Iceland as Paul’s Christmas present. Amassing a pharmacy’s worth of remedies to fight my fledgling cold, we set off with a certain amount of trepidation, having been monitoring the worsening weather forecast for a week before our flight. As it turned out, we needn’t have worried – more through luck than design, we managed to choose the perfect days for our various activities and the weather didn’t stop us doing anything we’d planned. We had less luck with our absconding luggage, but ‘Wow air’ (both as excitable and blasé as they sound) did eventually track the case down and deliver it to our hostel the next day. This unexpected turn of events also allowed us to conduct a full scientific experiment on the benefits or otherwise of thermal underwear. 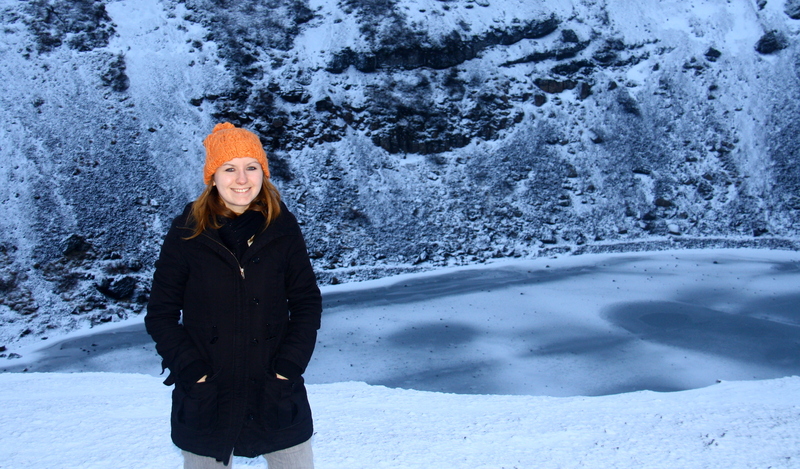 The conclusion: you need your long-johns in Iceland! 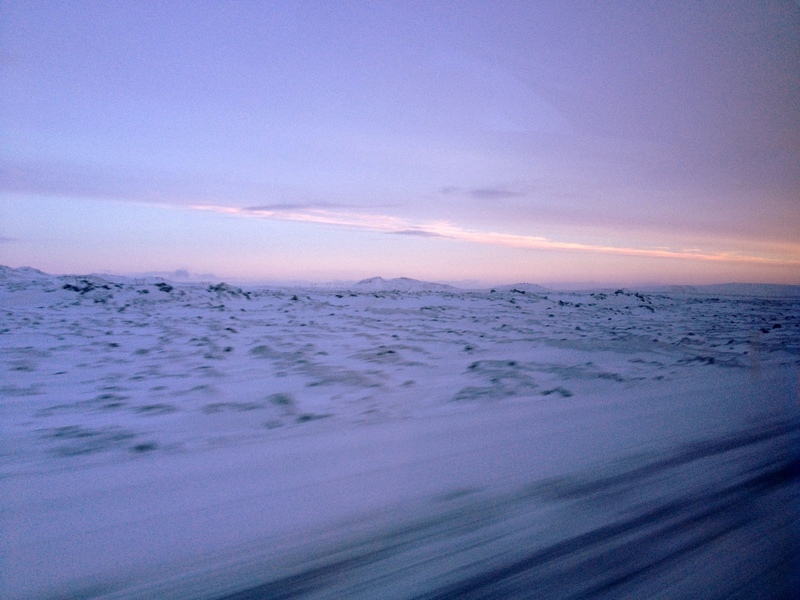 Less than an hour after checking in at Kex – our “boutique” ex-biscuit factory hostel – we jumped on a bus to Þingvellir national park, home of the largest lake in Iceland, site of the rift valley marking the mid-Atlantic ridge, and birthplace of parliament. Of course, we couldn’t see any of that because it was pitch black. 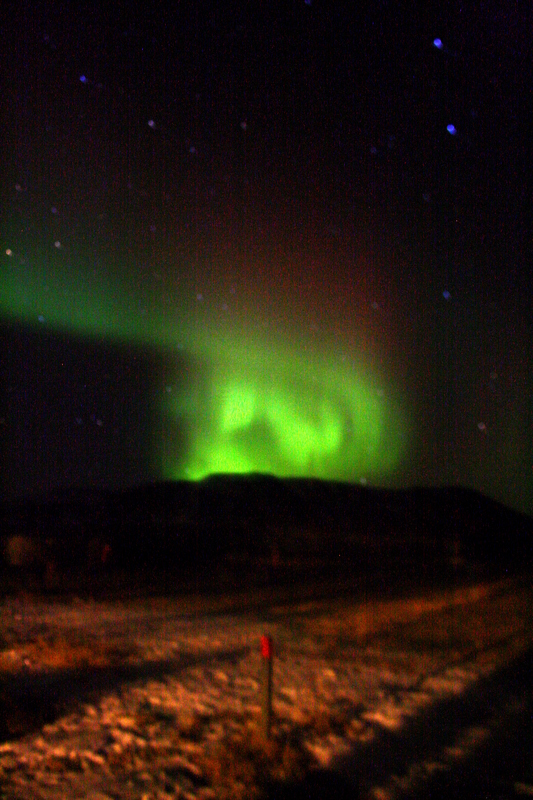 But we knew we’d be returning a few days later and our mission on this occasion was to see the Northern Lights. Unexpectedly (see previous comment about weather-watching), it was a beautifully clear night and there were thousands of stars out. Away from the city lights, you could clearly see the Big Dipper, Orion, the Pole Star, Jupiter, the Seven Sisters, a swathe of the Milky Way… plus we think we either saw the space station moving across the night sky or a satellite. And a shooting star! I always seem to miss shooting stars, so was particularly pleased with that one. The bus took us to a couple of different locations and patience won out – just as I was tucking into a hot chocolate at a roadside kiosk to keep warm, someone shouted that it was starting and we all rushed over to see translucent green swirls moving slowly up over the mountains. The eerie shapes became brighter and sharper, lasting a good 20 minutes. A fellow gawper, checking a trusted meteorology site, told us that the night’s activity was rated 3/10 on the Aurora Borealis scale, but not at all bad for our first time! After brekkie in Grai Kotturinn on Hverfisgata (a cute Americophile caff) and a wander through the stunning Harpa concert venue the next morning, we headed to the harbour and booked onto a whale-watching trip. Again, relatively clear skies ensured success. 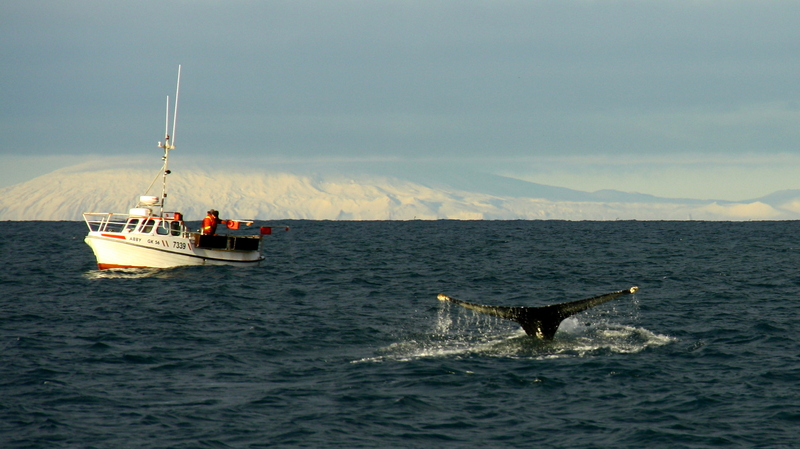 Our friendly Mancunian guide found us two frolicking humpbacks and I managed to get a nice snap of a disappearing tale fin. A good job too, given it was desperately cold on the boat. Even our ridiculously-oversized padded red snow-suits didn’t protect us adequately from the biting wind, and when I was splashed by a sub-zero wave my face starting turning an unnatural shade of blue. We certainly earned our burgers and ales (rum for me) back at Kex. The bar at Kex was very ‘now’: a retro-cool haven for bearded Icelandic men and gorgeous blond women to hang out listening to Ásgeir Trausti (our best musical discovery of the holiday) and other alt-folk, whilst perched on stools eating harðfiskur (a popular snack of hard, dried cod or catfish). A great place to hang out and warm up! The next day, however, started decidedly less that pleasant – thick grey cloud, lashing wind and rain… So a leisurely breakfast at Tíu Dropar on Laugavegur was needed. Bacon and eggs, with waffle, fruit and skyr (a type of strained yoghurt) on the side – delicious! And after climbing to the top of Hallgrímskirkja, the city’s landmark Lutheran church, the skies cleared and we decided to brave a trip to the Blue Lagoon. 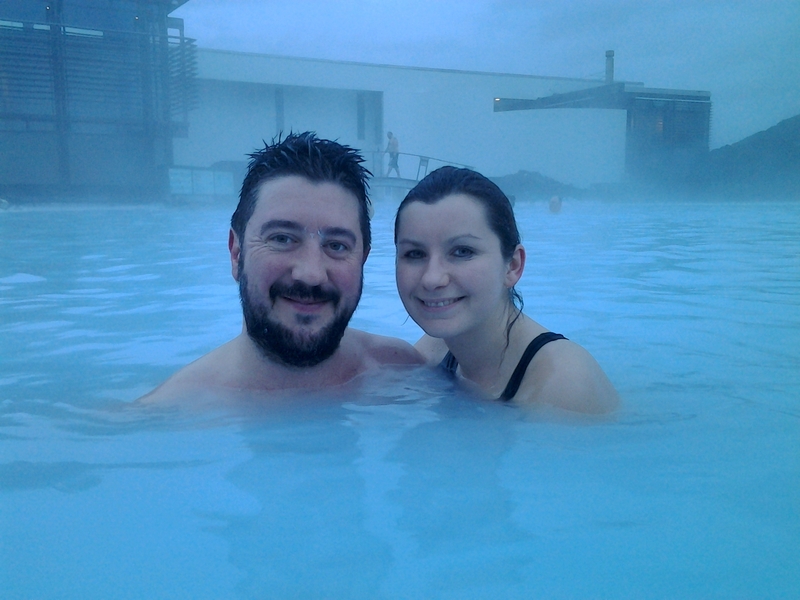 The geothermal spa is about an hour’s drive from Reykjavik and one of the places I’d been really keen to see. The milky water is a toasty 37 degrees Celsius and the sludgy silica on the bottom of the lake apparently very good for your skin. The mid-afternoon trip proved a great time to visit, providing an opportunity to see the spa in daylight and illuminated at dusk (the sun setting at around 17:30 in the winter months). Not sure about the bathers who were ordering ice-cream from the bar though. Brrrrr! 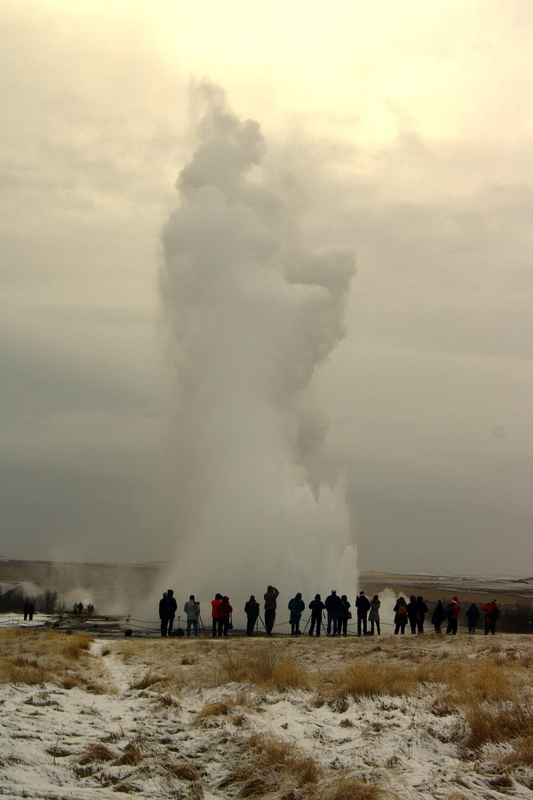 Our final day was spent on a tour of the ‘Golden Circle’: Geysir, Gullfoss, and Þingvellir. 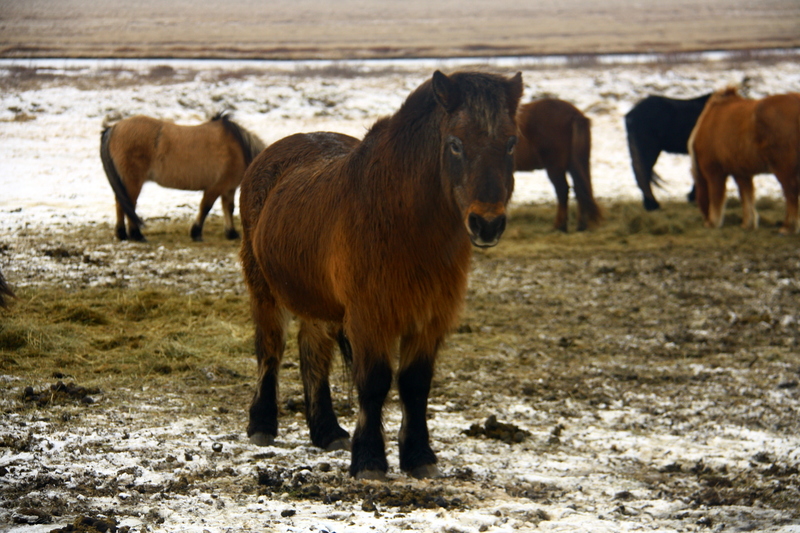 The landscape was stunningly beautiful – barren, rocky plains inhabited only by viking horses, backed by volcanic mountains. A liberal covering of snow made it all the more picturesque. 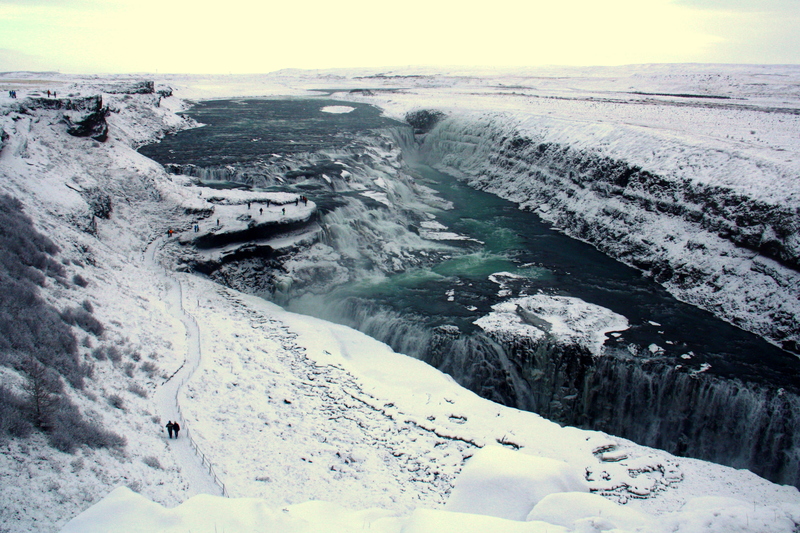 For me, the highlight was definitely Gullfoss waterfall. 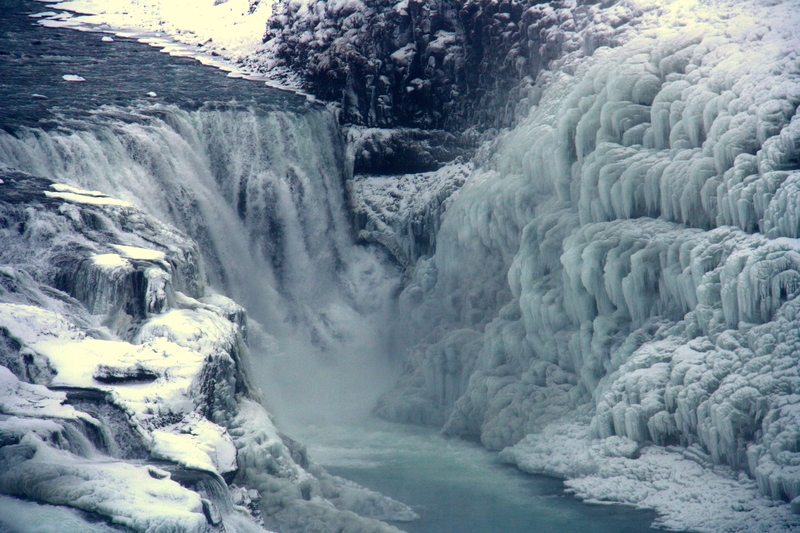 Located in the canyon of the Hvítá river, the epic scale of the falls was a complete surprise and the dramatic reveal as you walked down towards the lookout point took my breath away. Needless to say, many many photographs were taken! We had a lot of fun at Geysir as well, waiting for the powerful “gush” of boiling water (the meaning of the Old Norse word ‘geysa’) to project 70 metres in the air. Despite being a bit of a tourist trap, it is incredible to witness. Unfortunately, by the time we got to Þingvellir the snow was coming down thick and fast, so we didn’t see the vistas in all their glory…although pushing through the valley in a blizzard was quite memorable anyway! A final stop at Grillmarkadurinn (The Grill Market) on Laekjargata back in Reykjavik concluded a wonderful break. The eight-course tasting menu (a birthday treat) left us painfully stuffed (we even tried to give away a dessert to a neighbouring table) but it was absolutely delicious. I’d certainly recommend it to anyone planning a visit. I think a return trip to this beautiful country will be in order. There are puffins still to see after all! 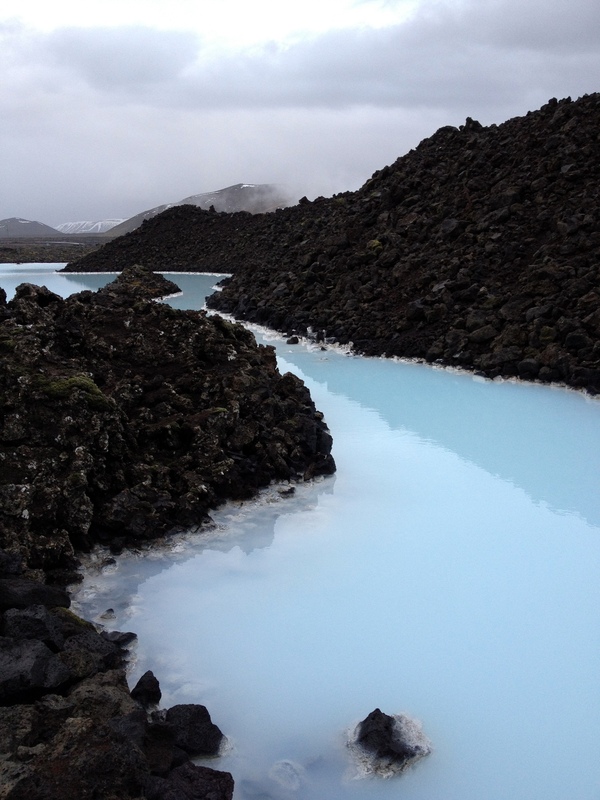 This entry was posted in Travel and tagged Þingvellir, Blue Lagoon, Cold, Geysir, Gullfoss, Iceland, Northern Lights, Reykjavik, Whale on February 16, 2013 by victoriassecretblog.